I’m addicted to trying new recipes, using Recipezaar.com - so if I won this I would use it in my kitchen. I’d also draw pictures with my 4 yr. old with it. I was laid off from my job over a year ago, and am starting a new job next week making about 1/2 what I used to. Winning this PC would mean I could finally own my own computer and not rely my family, friends or the library to use theirs. Buying my own computer is just not possible for me at this time. I would want to keep it for myself when I travel, but I’d probably end up giving it to one of my kids. I would use it when I travel to keep in touch with family. I just started a blog and would love to be able to add posts from anywhere! What a cool idea! I would show it to all my friends and then laugh hysterically because they don’t have one! I’d put on Anne Murray’s “Could I Have This Dance,” and waltz around the living room with it. If chosen, I would use the printer to print cards of my own making. I would use the laptop during my live gaming stream to interact with my fans, in addition be sure to tell them what a great computer it is! I am a subscriber and would use the computer for school and my blog! I’d use this to replace my really old, really afwul computer that is forever breaking down! I would use it to replace my old, outdated laptop. I would use this to help me write grants for seveal non-profit organizations! This would be wonderful cuz I could take it on the go! Thought I would have to wrestle it from my hubby and kids! I would use it to download music for the weddings that I DJ. I would use it to help me write a book and illustrate part of it. Thanks! I’m currently studying computer science and have never had a laptop. 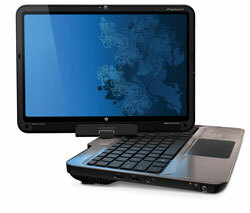 Winning the HP TouchSmart would help so much in my academic career. Also, I’m also an aspiring screenwriter. I would use the HP TouchSmart to practice and perfect my craft no matter where I am. Basically I would use the HP TouchSmart to it’s fullest potential. I would LOVE to win this! I’m a recently graduate, with a degree in digital photography. My boyfriend and I started our business late last year, and I edit a lot of pictures, and having a computer that I could use to edit directly on would be amazing! I love gadgets and don’t have this one although I know I could find lots of things to do with it. I need a media server, this would be perfect for the job! I think this would be a great computer for my fiance and I to both use to take notes in college classes next semester. I would also use it for blogging and photo editing, surfing the web, etc. I’m a subscriber! If I won, first I’d have to learn about all the features and how to use them, but I bet it would be a lot easier than my clunky desktop and I’d really like it for getting recipes in the kitchen so I don’t have to copy them down - I don’t have a printer. I like to design shirts for Zazzle, and this would make it more fun and easier. I would use it for taking notes during a class as I like to take notes on a paper, but keeping them together is a big problem. Directly having a scanned copy will solve that problem. To bring myself into the 21st century! I am an artist and would love to have this for sketching and drawing. If I was the lucky winner I would be a good wife and give it to my husband his birthday and our anniversary is right around the corner. I’m a subscriber, I would use it to read books and surf the web, thanks for the chance! I would use the HP TouchSmart as a great on-the-go notebook, as well as an easy to use at home system for viewing media files. Why get an ipad, when the HP TouchSmart offers the same ease of use, yet it can do so much more than an ipad can. but my daughter could use it for college. I am a subcriber, too. I am getting ready to go back and complete my degree (I was only short 15 hours when I attended college previously!) and though I’m excited and nervous, this touchsmart would make the perfect accessory in getting me through! This would without a doubt be the ultimate Mother’s Day Gift. I have never before owned a Laptop, Touch Screen Device, or anything of the sort. I would absolutely love for this to be my very first Laptop. I would finally be able to read my emails and talk to my Mother without having to worry about my old Windows 98 freezing up on me again. Please let me win this so that I can replace my 12 year old Desktop with a Laptop. As you can tell I don’t have a lot of money or else I would have updated to Windows Vista 5 years ago when it came out. Please, let me win! I subscribed and I would use the touchsmart for keeping my photos organized and I would be able to edit them and even be able to do it on the go! My daughter is graduating in June from high school and then we will be driving one way 1200 miles to visit family, this would be such a great gift for her. So I would give it to her. She deserves a awesome gift for all her hard work and dedication in keeping up her grades, being in sports, band and marching band and volunteer work. Also she is so sweet she would let me use it once in a little while. I will use it to write the next great American novel. I’m a subscriber. I’d love to use the TouchSmart as a media server, to have my entire family’s collection of photos, music, and movie files in one central place, and be able to view them any time and show them on our home theater screen. Thanks for the great giveaway! I would take this little baby everywhere with me. I’d read books on it, doodle, do business and stay connected to your site! If I was the ‘lucky’ winner of this ‘HP TouchSmart tm2 Tablet PC’, I would give it to my Mom as a ‘Mother’s Day’ gift! This would make the ‘perfect’ gift for my Mom; who - recently, after dropping out of college 36 years ago, decided to return to school to get her degree! I will be transferring to a university in the fall, but (thanks to my mom) I already have a PC. I want to give this Tablet to my mom as a Mother’s day gift because she is relentless; she won the battle against ovarian cancer. Every morning, she prepares my two sisters for school. Every Monday morning she volunteers at MADCAAP (Madison Countians Allied Against Poverty), distributing food and clothing and every Tuesday evening she attends classes that educate people on how to escape poverty. If I won, I would give my 5 year old laptop to my son who is in 5th grade, and finally have a computer to myself. Then, I would devote my energy to finishing a book.